The word big is actually an understatement if we are going to talk about Dream Cruises’ Global Class flagship. Once construction is finished, her amenities will include a massive theme park featuring a roller coaster with virtual reality, a cineplex, a spa, ample shopping facilities as well as authentic Asian and international dining experiences and fast food restaurants. And there’s no better way to mark the construction of the largest ship ever built in Germany, where Genting Hong Kong’s MV Werften shipyard is located, but to celebrate it with the world. FIRST LOOK. 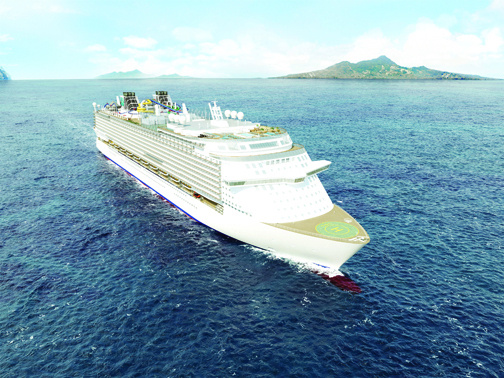 An artist rendition of Dream Cruises’ new Global Class cruise ship unveiled during the the 'keel laying'ceremony in Germany which was livestreamed in Singapore and other key cities. It was a momentous occasion for Genting Hong Kong when it livestreamed the keel laying ceremony straight from its shipyard in Rostock, Germany last month. The livestream was made available in key cities where the leading company engaged in cruise, entertainment and hospitality business operates. In Singapore, media and other business partners from Malaysia, Philippines and other neighboring countries were invited to witness the special ceremony. Over 1,000 business partners, travel agents, media and special guests from Hong Kong, Beijing, Shanghai, Guangzhou, Taipei, Tokyo and Sydney were able to witness the event via the Dream Cruises Facebook Page and Weibo in China. Approximately one thousand shipyard employees, partners, and guests from the worlds of business and politics accepted the invitation to the event as well. Prime Minister Manuela Schwesig, Minister of Economic Affairs, Harry Glawe, Genting Hong Kong’s Executive Chairman Tan Sri Lim Kok Thay, Group President Colin Au, Dream Cruises President Thatcher Brown and MV Werften’s CEO Peter Fetten placed the traditional lucky coins in the keel before the 95-meter high gantry crane lowered the section into place. 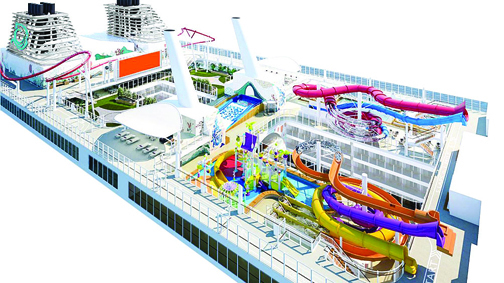 The massive and luxurious cruise ship will feature a cineplex, a theme park – including a roller coaster, a waterpark, Asian spa, and multiple authentic Asian dining experiences and affordable shopping facilities in addition to luxury retail boutiques. “The Global Class is designed from the keel up for the Asian source market which requires more exciting public areas and larger cabins than traditional cruise ships. The new ship will also be supported by the world’s leading technology and digital systems catering to Asians who are more used to digital technology,” said Tan Sri Lim Kok Thay. “Ownership of MV Werften also means greater flexibility in incorporating the latest technical advancements for the shipyard to build the best cruise ship in the world,” he added. “This is a very proud moment for Dream Cruises. Building on the successful debuts of Genting Dream in 2016 and World Dream in 2017, the addition of two Global Class ships to the fleet will allow Dream Cruises to offer our partners and guests more itineraries worldwide,” said Thatcher Brown. “Expanding the Dream Cruises brand globally goes hand-in-hand with an aggressive new-build program that will more than double our capacity in by 2021 and help us realize our aspiration to be “Asia’s Global Cruise Line,” Brown further stated. 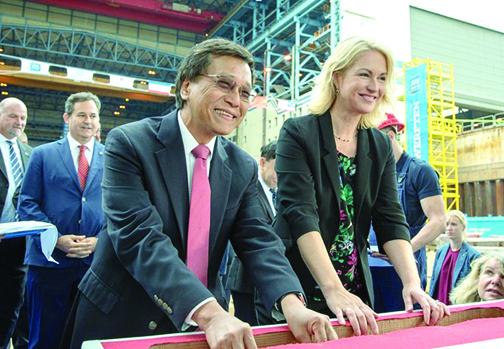 Prime Minister Manuela Schwesig (right) and Genting Hong Kong's Executive Chairman Tan Sri Lim Kok Thay (left) places lucky coins in the keel of Dream Cruises’ new Global Class ship. Production of this 204,000 gross ton ship, which will measure 342 meters long and over 46 meters wide, will take place in parallel in Wismar and Rostock. The 220-meter-long midship will be manufactured in Rostock and will move to Wismar in 2019, where the bow and stern, as well as the superstructures, will be mounted. The 2,500 passenger cabins produced by MV Werften Fertigmodule in Wismar will also be installed in Wismar. A total of around 600 companies will be involved in the construction process. The Global Class ships are designed for the rapidly growing Asian cruise market and will join the Dream Cruises award-winning fleet, allowing Dream Cruises to offer cruises all over the world to become “Asia’s Global Cruise Line”. As a pioneer in the Asian cruise industry, Genting Hong Kong took on the bold initiative to grow the Asia-Pacific as an international cruise destination with the founding of Star Cruises, “The Leading Cruise Line in the Asia Pacific”, in 1993. To further expand its cruise portfolio in the region, Genting Hong Kong launched Dream Cruises, the first-ever Asian luxury cruise line to cater to the high-end market. Recognized as “The World’s Most Awarded Luxury Cruise Line”, Crystal Cruises extends Genting Hong Kong’s reach in the global up-scale market. The establishment of the German shipyard MV Werften in 2016 will capitalize on the growing demand for new cruise ships and realize the company’s global expansion plans for its three cruise brands. Meanwhile, initiating the Group’s foray into land-based attractions, Resorts World Manila was the first integrated resort in the Philippines when it opened in 2009. A one-stop, non-stop entertainment and leisure destination, Resorts World Manila features world-class entertainment, unique events, and exciting lifestyle options throughout its extensive premises. Genting Hong Kong’s investment in iconic Singapore nightlife brand Zouk – a world-class entertainment institution and trendsetter in Asia’s dance music scene, and perennial top-ten fixture in the annual DJ Mag Top 100 Clubs global poll - further diversifies the company’s appeal to a younger and more dynamic clientele.